Black-chinned Hummingbird: Breeds from British Columbia south to Mexico and central Texas. Spends winters in Mexico. Preferred habitats include mountain and alpine meadows, woodlands, canyons with thickets, chaparral, and orchards. The Black-chinned Hummingbird is a small hummingbird averaging only 3 ¼ inches long at maturity. This species is fairly widespread in its favorite breeding areas, which include open, semi-arid land near water. These birds are commonly found in the western United States, northern Mexico, and southern British Columbia. They typically migrate to Mexico for the winter, and like to feed on plant nectar and insects. 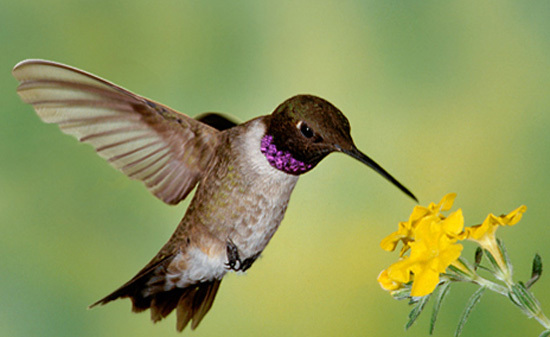 The Black-chinned Hummingbird feeds on these insects after catching them with their wings. Due to the bird’s small size, larger birds mistake them for insects and food. 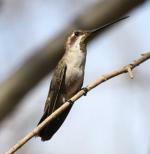 The Black-chinned Hummingbird currently has a conservation rating of Least Concern. In cold weather, a Black-chinned Hummingbird may ingest three times its body weight in nectar in one day. Their nest can expand as nestlings grow. The spider and insect silk holding it together stretches and allows the nest to grow along with the growing chicks. A group of hummingbirds has many collective nouns, including a “bouquet", "glittering", "hover", "shimmer", and "tune” of hummingbirds.